What do you get when you combine culinary mastery with a fine art degree? 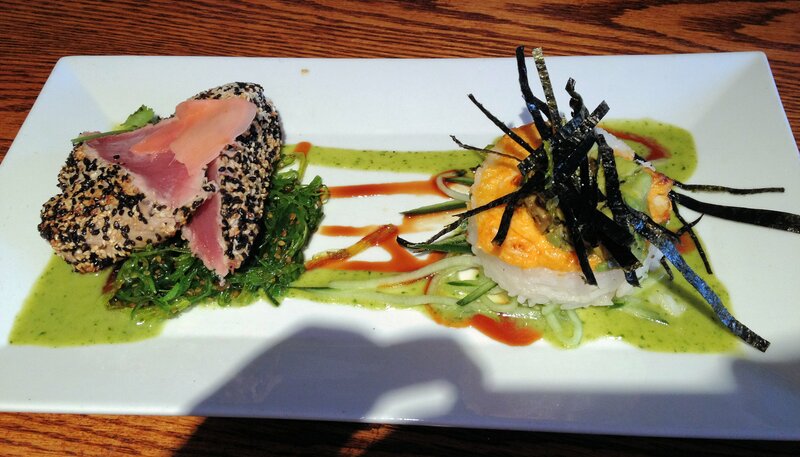 Kaz Okochi, of KAZ Sushi Bistro, makes some delicious and gorgeous looking dishes. 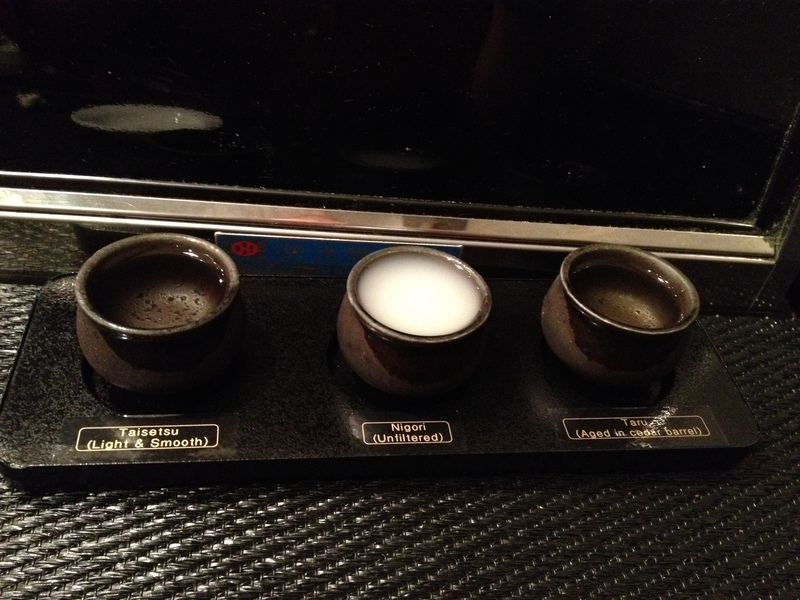 I started off with the Sake Tasting #1 (Taisetsu, Wakatake Nigori, and Yatagarasu Taru) and the Bird’s Nest special. 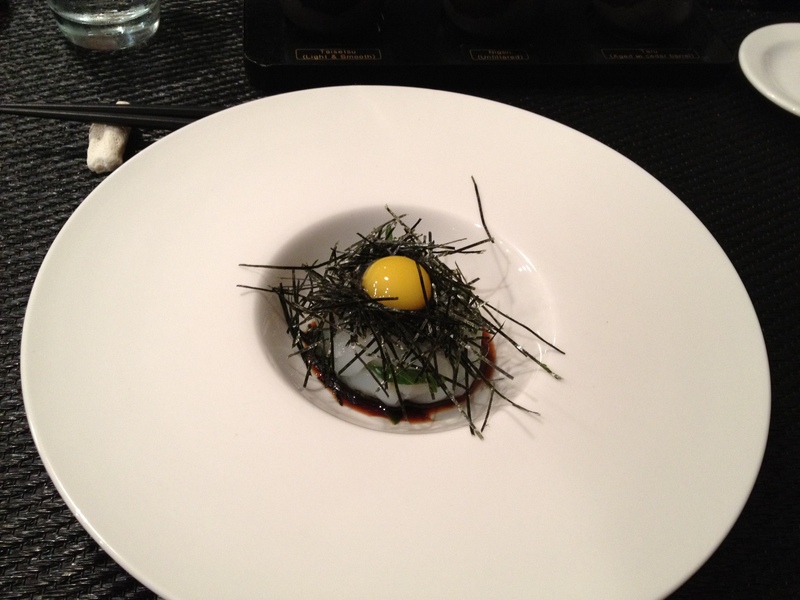 The Bird’s Nest was a bed of thin slices of baby calamari and uni in a truffle-soy sauce, with thin strands of seaweed and a quail egg on top. This was a really tasty starter. Uni, or sea urchin, was actually the first sushi I ever had, and it almost turned me off to the genre. 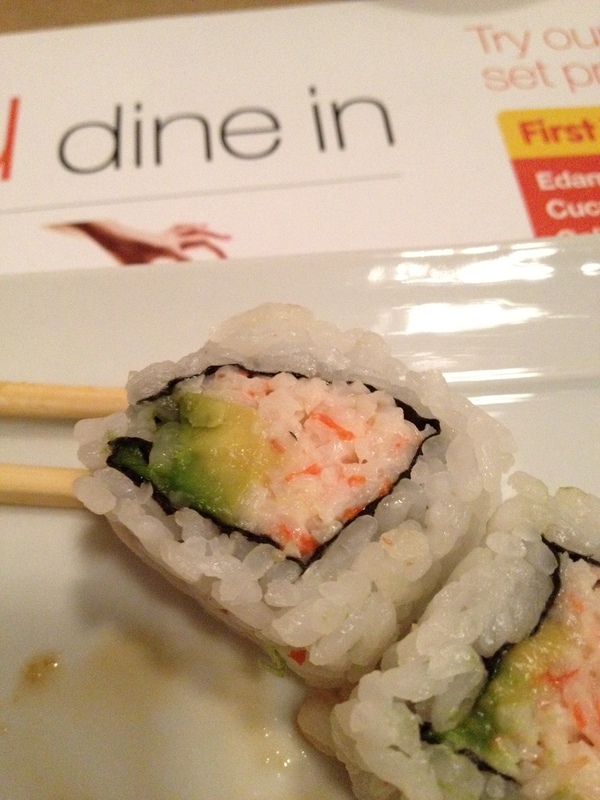 Thankfully, it was followed with a spicy tuna roll, which forever cemented my love for raw fish. This uni, however, was high quality stuff with a great creamy, earthy taste. For this meal, I wanted a guided tour of the best that KAZ had to offer. 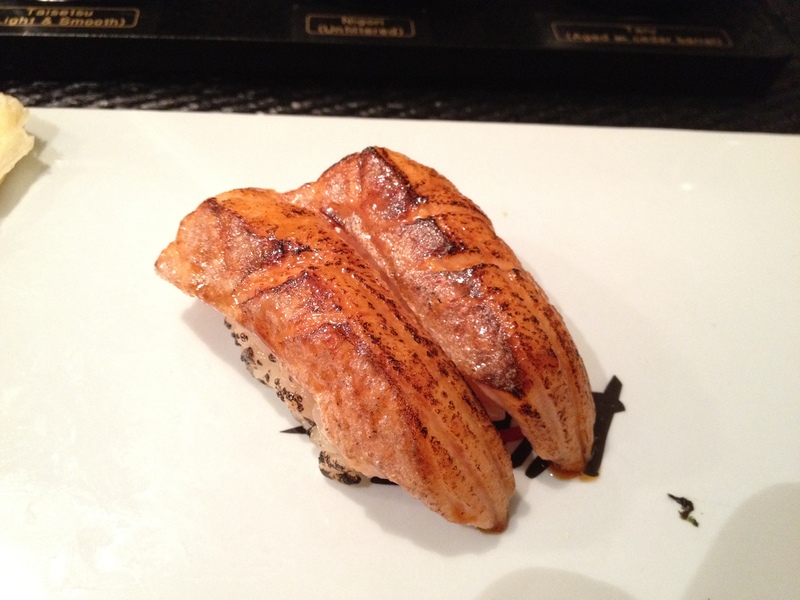 I went with the Omakase Ultimate Sushi tasting menu, which is only available at the sushi bar. One of the chefs makes two pieces at a time for the diner utilizing the freshest ingredients. Each serving was simple, yet unique, offering interesting flavors. Between scallop with pineapple, ebi with yuzu tapioca, Japanese horse mackerel with ginger-scallions, walu with wasabi leaf, seared salmon, and bigeye tuna, I was very impressed with the quality of the food, the tastes, and the presentation. 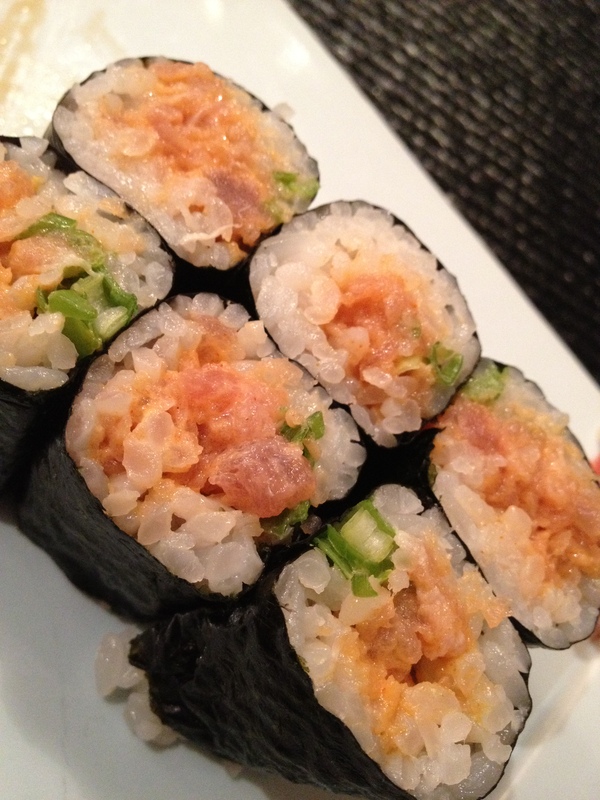 Being that my usual favorite roll is that of the Spicy Tuna variety, I also put in for an order of that. Simple, yet well done, and not overly heavy. From what I have heard, KAZ Sushi Bistro is also one of the only places in the DC-area willing to serve the infamous fugu (which features itself on my bucket list). Read more about it here on a (dated) Chowhound review, or at this more recent article from Washingtonian. 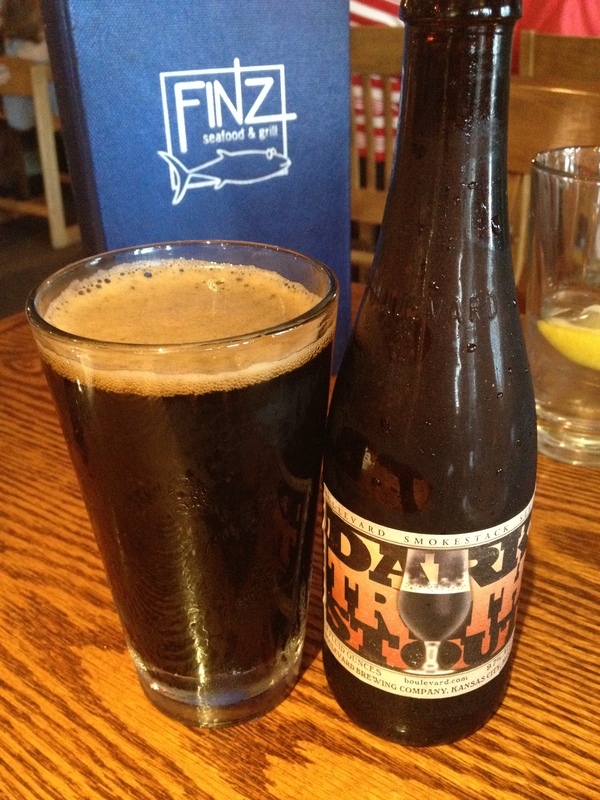 Based on my friend Kara’s recommendation, I checked out Finz in Salem. 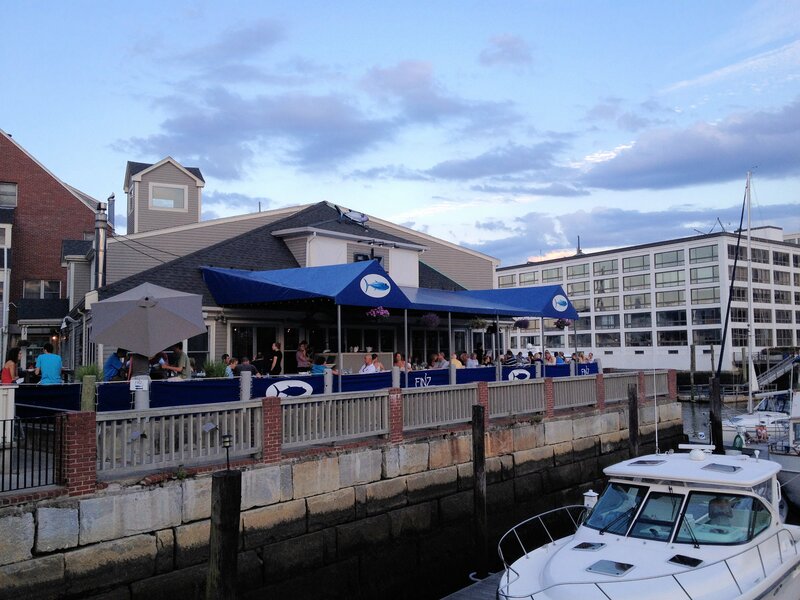 Finz, a harbor-side restaurant on Pickering Wharf, has a fantastic menu full of excellent starters, entrees, and cocktails. View of the Finz deck. Being that I’m not local to Salem, and because everything sounded so good, I went a little overboard with the appetizers. I wish I could have had more than four – several others sounded excellent – but I had to draw the line somewhere. Our server, Kim, made some excellent recommendations throughout the evening. 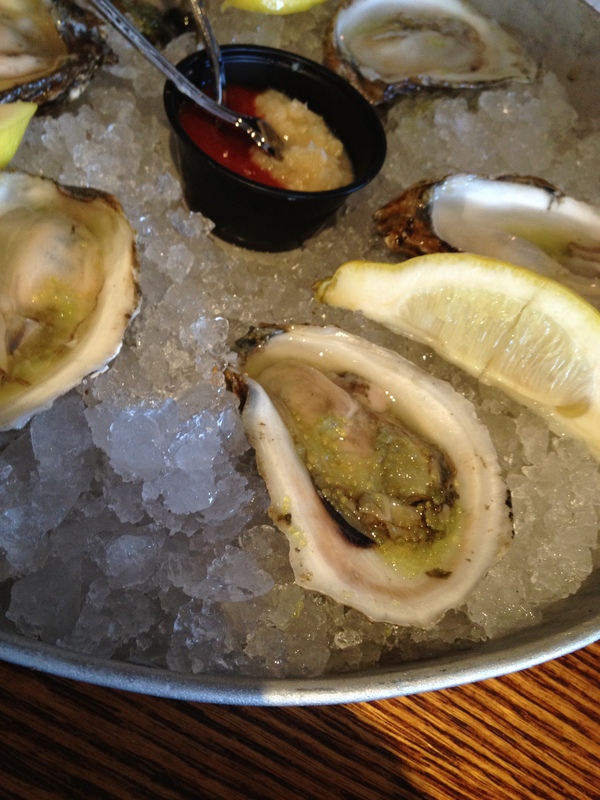 I started off with a half-dozen of the Finz Wasabi-Stoli Oysters, a popular item at the restaurant. The oysters were topped with wasabi caviar and Stoli “Raz” vodka, and served with cocktail sauce. It was a good change from regular oysters-on-the-half-shell. Fresh oysters with a twist. Next up was the Tuna Tartare. 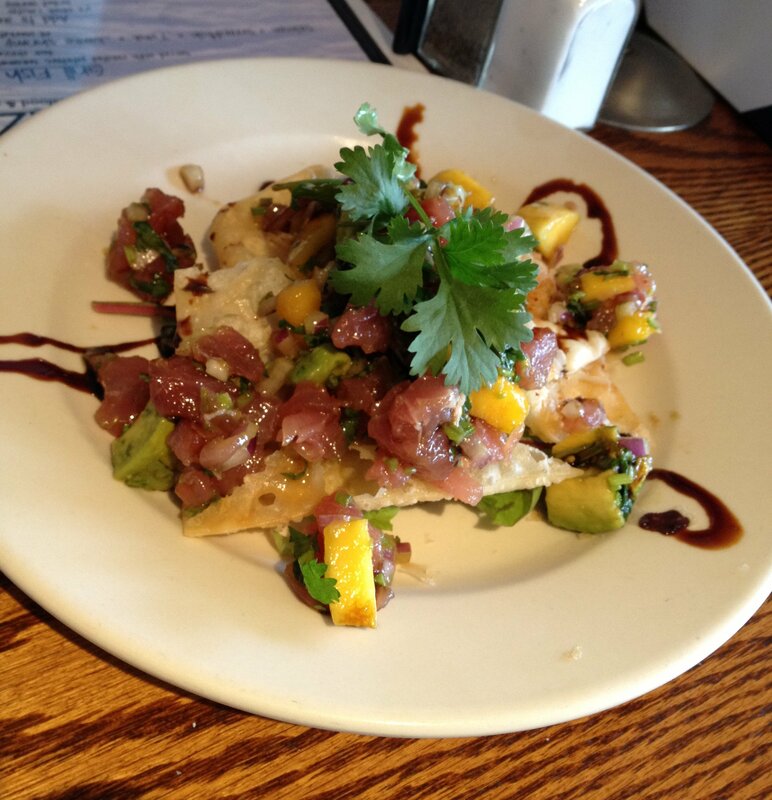 It was excellent, and included mango, avocado, red onions, ginger-soy dressing, and wonton chips. I was sad when it was all gone. 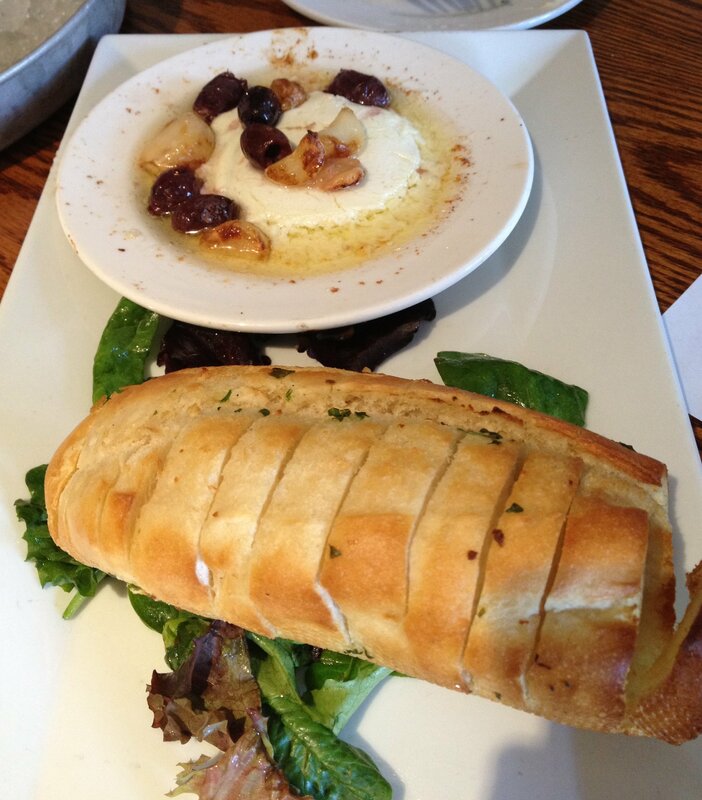 Baked Goat Cheese with roasted garlic, Kalamata olives, and garlic bread followed. A great Mediterranean dish, it reminded me of Zaytinya back in D.C. I was surprised at how good it was – it was, after all, relatively simple – but I’d get it again. Great Mediterranean touch to the meal. The menu had a few interesting du jours, including a gazpacho of the day (I didn’t get it, although I was considering it – that day’s was an asian version) and a guacamole of the day (which I did get). 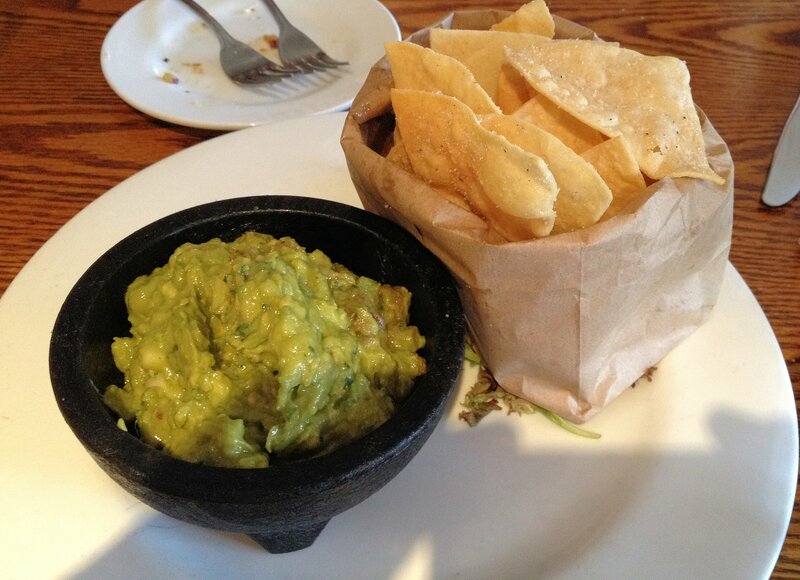 This particular day Finz was serving an apple cinnamon guac with cinnamon-sugar chips. It was a very different flavor from the norm and worked really well…just another indicator that the creative talent at Finz is top-notch. I’m a big fan of guacamole, and this version was creative and delicious. Completing this last starter, we moved on to the entrees. Going on our server’s recommendation, I went with the Black and White Sesame Tuna, which was served rare on top of seaweed salad. It was plated with a sushi rice cake topped with crab “dynamite”, which was similar to the creamy and spicy crab topping found on some of my favorite sushi rolls, and avocado. 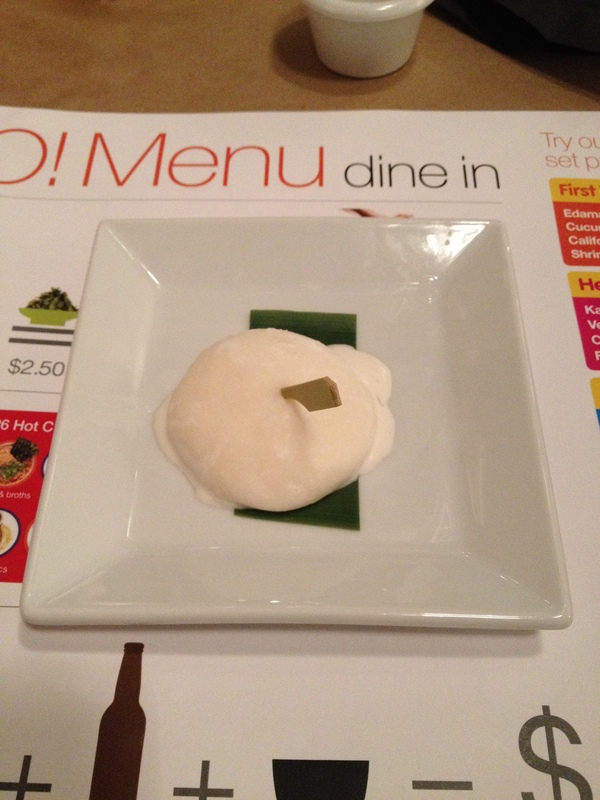 A wasabi cream lent some additional flavor to the dish. I think this may be my new favorite tuna dish. Excellent all around. What a great dish this was. I’ll probably be getting it next time I am in Salem. Tuna is definitely something that Finz does well. I’d encourage visitors to try out some of that, although likely whatever one gets there would be excellent…I was impressed with all of the dishes. Dessert was also fantastic. I went for the Warm Chocolate Chip Cookie Pie. The description of it interested me because it said it was baked cookie dough. 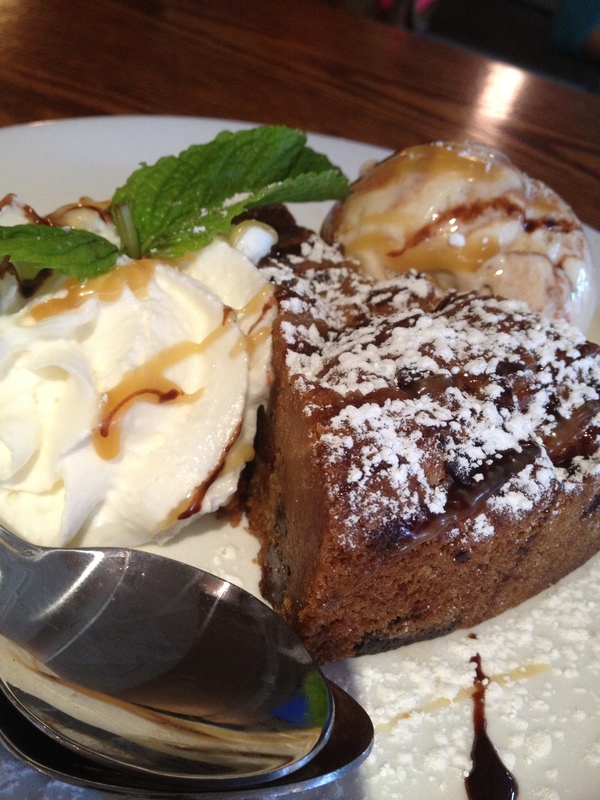 It was like a deep dish, cake-like cookie – soft and moist. Good stuff. Awesome close to the dinner. 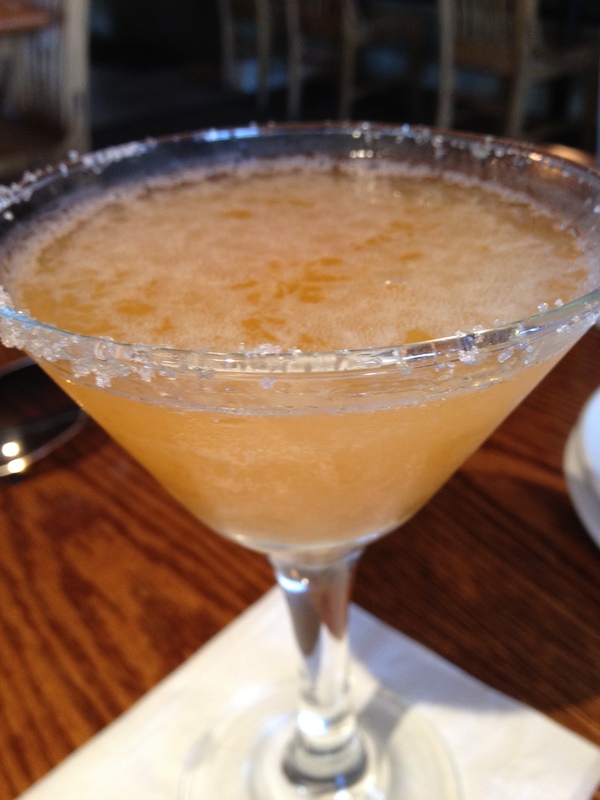 Ocean Flower – Ketel One vodka, St. Germain, papaya puree, agave nectar, yuzu juice, sriracha-infused sugar rim. I was a fan of this one…just the right level of sweet. Cucumber Spritzer – Crop Cucumber vodka, Thatcher’s Cucumber liquor (hadn’t heard of this, but it’s now on my to-buy list), lemongrass syrup, white wine, soda water. Cool and refreshing. Strawberry Fields Lemonade – Ketel One Citron, rhubarb basil simple syrup, strawberry puree, lemonade. This one was dangerous…tasted like a really tasty strawberry lemonade. Good beer selection as well. If you’re around Salem, Finz deserves your attention. Check them out. 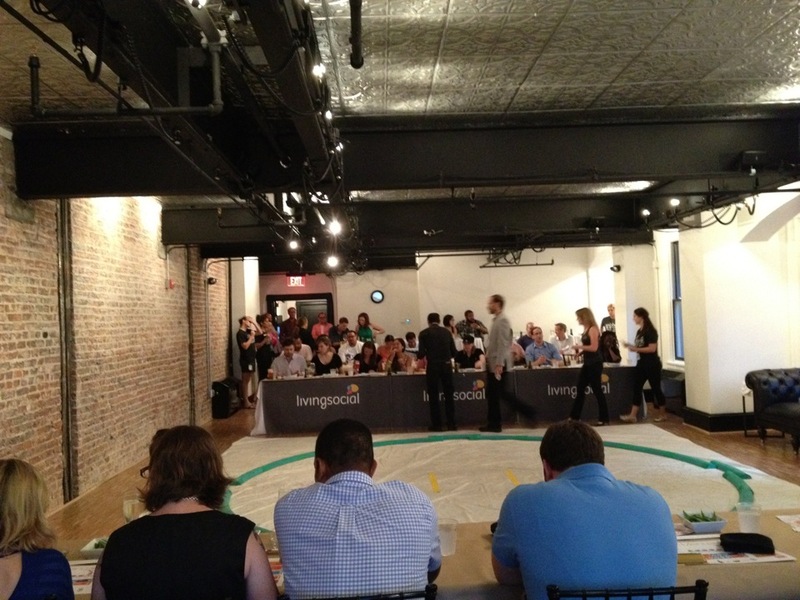 I went to a great Sumo wrestling event that the LivingSocial 918 F Street team put together for their DC-based clientele. Not only did we get to watch two giants battle it out, but we got a glimpse of YO! Sushi‘s new US-based operation. YO! Sushi has been around in the UK since 1997 (I had the chance to eat at the one a couple of blocks from Bedford Square in London in the summer of 2003), and it has expanded to Ireland, Portugal, UAE, Bahrain, Norway, and other locations globally. 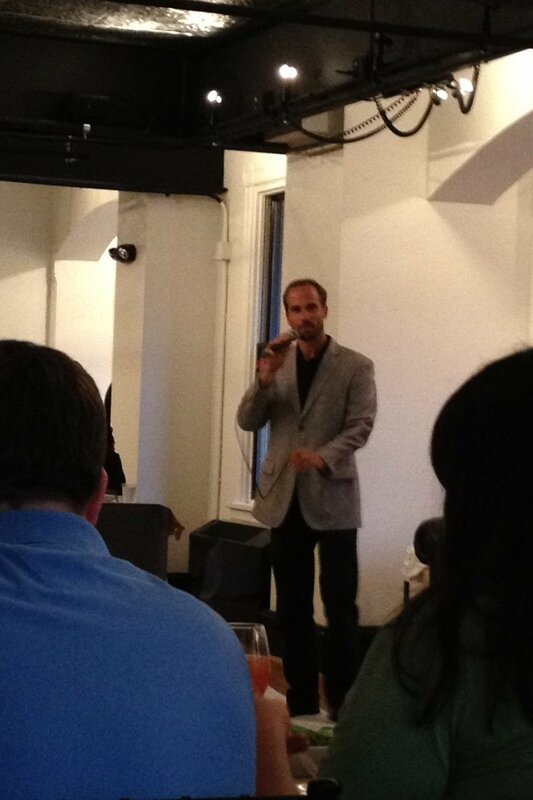 The first US location will be opening at Union Station in DC on 11 July 2012, and this was a great kickoff. I have to say that when I tried YO! in 2003 I was not thoroughly impressed. I was more a fan of the kaiten-style sushi bar than anything else there. However, the quality has been stepped up based on what I tried, and I’ll definitely be stopping in to their new location once in opens to see if it continues to live up to my new expectations for it. The nigiri sushi was especially fresh and tasty, and the California rolls (although atypical from the norm – I think mine was crab and avocado with no cucumber) were better than most I’ve tried – rather than using crab stick, it tasted like fresh crab (definite taste difference between the two). My view of the Sumo ring. The menu for the evening. We started off with some edamame and sashimi. 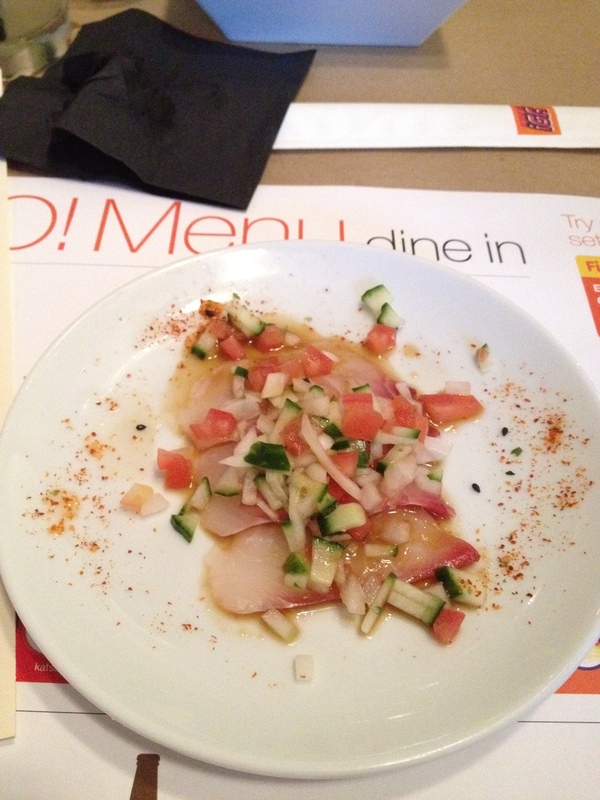 The sashimi, fresh and delicious, came out drizzled with a yuzu salsa that made the dish tangy. I was a fan of this course, and I’d get it again at the restaurant…maybe two of them. 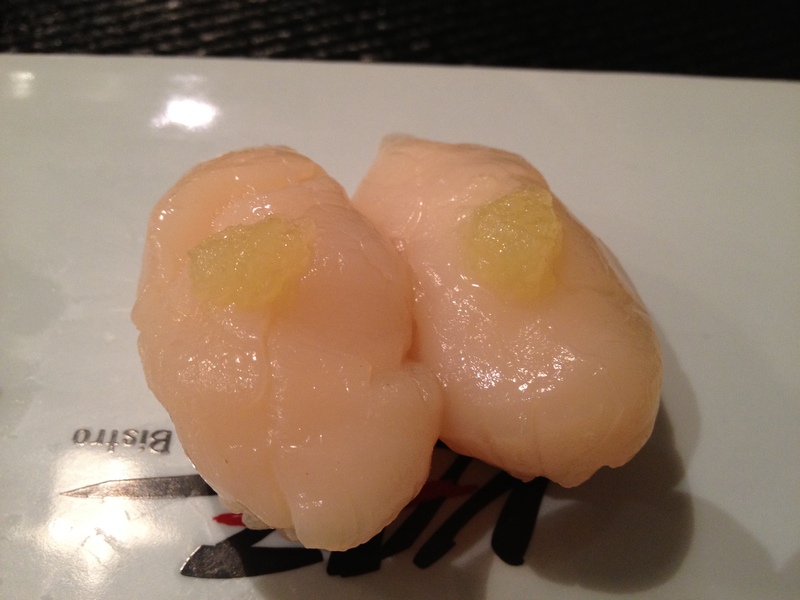 Whitefish sashimi in yuzu salsa. Good starter. While we dined, the director of the US Sumo Championships, Andrew Freund, went over some facts and information about Sumo in general, and US Sumo in particular. We then met the evening’s challengers – Byambajav Ulambayar of Mongolia, seven-time winner of the US Sumo Open gold and three-time World Sumo Champion, and Kelly Gneiting of Arizona, winner of four US Sumo Open medals and three-time US Sumo Champion (340 and 415 lbs respectively). Director of US Sumo Open, Andrew Freund, explaining Sumo to the audience. 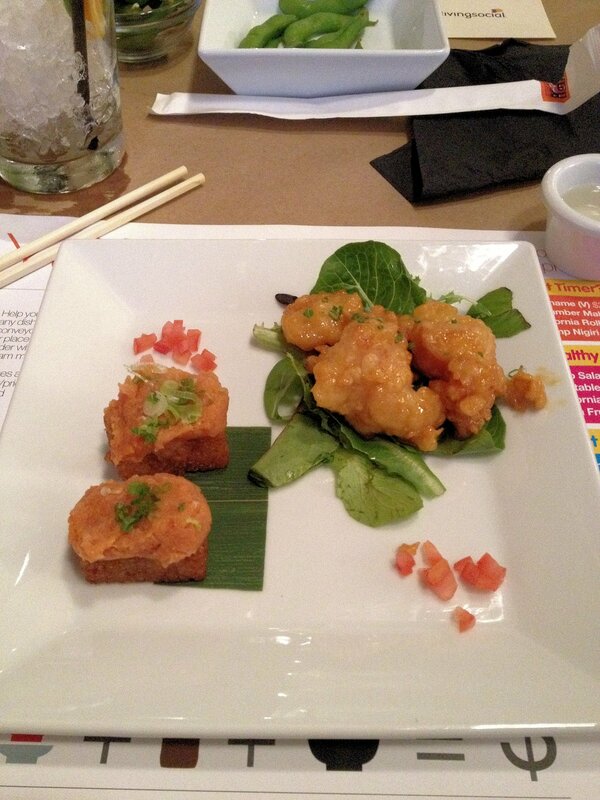 Next up on the menu was Spicy Tuna Tartare on Crispy Rice, and Shrimp Tempura Glazed with Creamy Miso. I’m not sure that I’ve had crispy rice sushi before, but this wasn’t bad. The shrimp tempura with the somewhat sweet miso glaze was tasty…it reminded me a little of fried and glazed Chinese dishes. Tuna tartare on the left, tempura shrimp on the right. While enjoying the course, the match began in earnest. There were five rounds total, with Ulambayar winning 3-2. It’s pretty impressive seeing guys of this size throw each other around…I certainly wouldn’t want to see one of them charging at me. Next up on the menu was the previously mentioned nigiri sushi (Albacore Sushi with Citrus Ponzu) and maki (California Roll). Both were excellent. A great California Roll. I don’t normally get these since they’re done everywhere, but I’d get this one again. 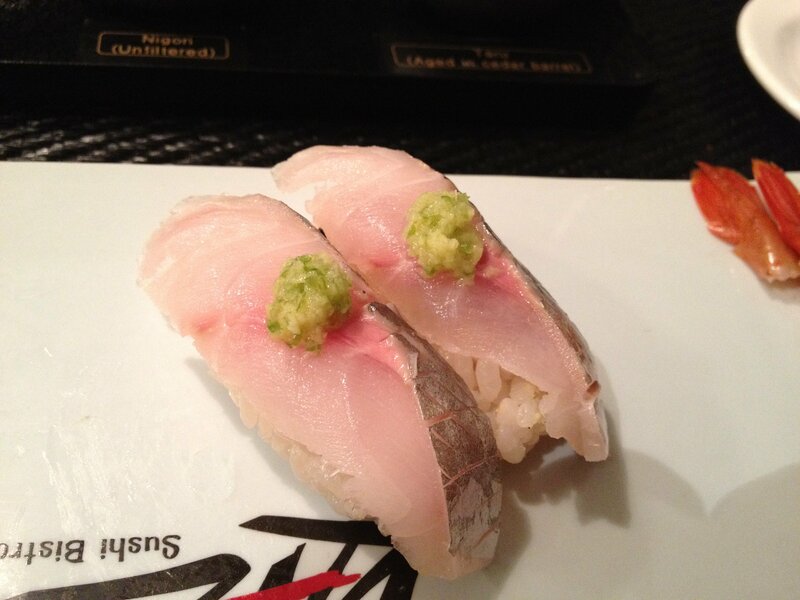 Fresh albacore – a favorite of mine – with a tangy citrus ponzu sauce. The drinks for the evening were great too. Everyone was provided three sakes during the courses, and there was also beer, wine, and a cocktail called “Sumo Smash” (vodka, St. Germain, Aperol, and citrus) available for a price. The first and second sakes were filtered (thus, they were clear), and the third was unfiltered (and therefore appeared cloudy). The first, Diamond Sake (probably Momokawa brand, but that wasn’t specified), was smooth and buttery. The second, Rock Sake (possibly this one), had what I picked up in the taste as a hint of blackberry. The third was Pearl Sake (probably also Momokawa, based on this review which picked up on the same tastes), and was tropical in nature…I definitely picked up on the taste of pineapple in this one. The Sumo Smash was also a good punch-like cocktail…I’ll have to recreate that. For those in the audience who were brave enough (i.e. not the author), there was an opportunity to go head to head with a wrestler of his or her choice (yes, one female tried it out), adding some additional interactivity to the event. Dessert was Mochi Ice Cream of various flavors. I grabbed a vanilla one, although they also had green tea and strawberry available. Essentially it is ice cream inside of a rice cake. I’m not usually a fan of stuffed rice cakes, but with the ice cream it wasn’t bad…the shell was much less tough than the others I’ve had. Great event overall…this one sold out faster than any I’ve seen on LivingSocial. If they offer it again I’d highly encourage it as an option for a fantastic date night out. Check out YO! Sushi when they open, and if you beat me to it let me know what you think. The author with the champs. Man, I’m in good shape. 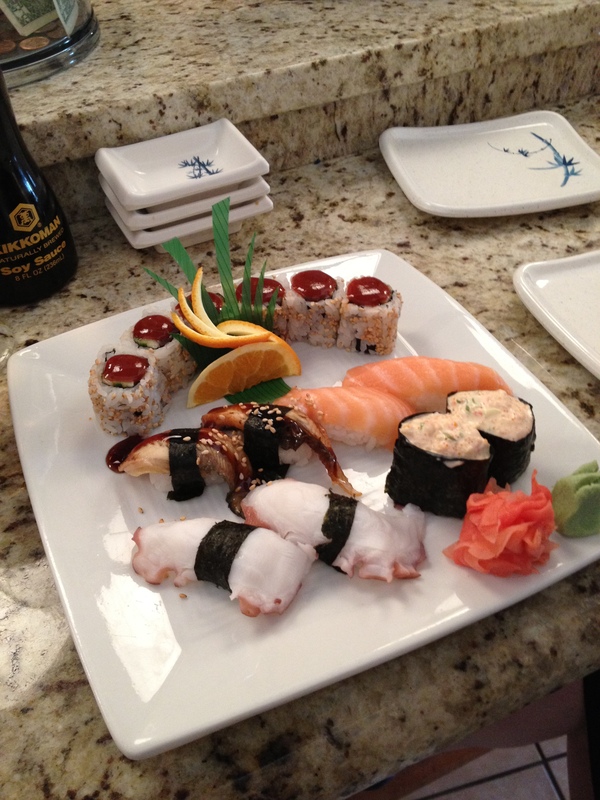 Do you live in Northern Virginia and feel the need for some excellent sushi? 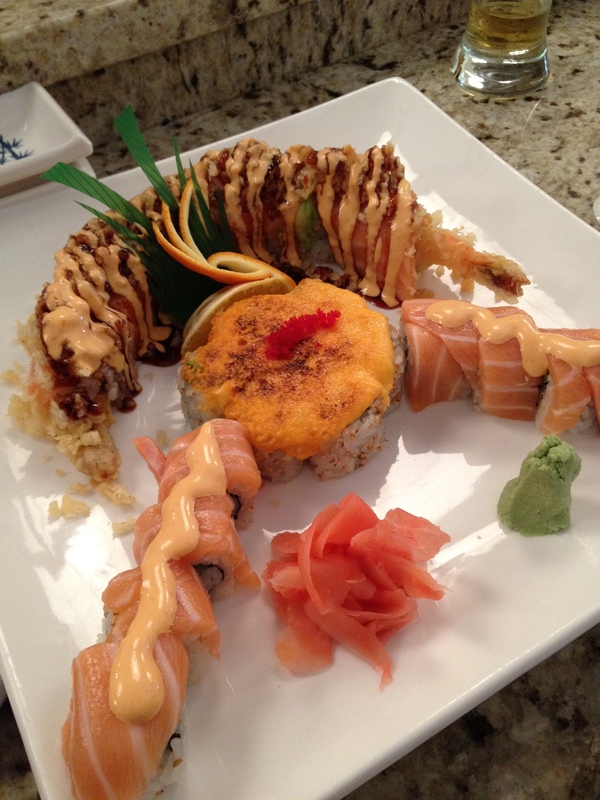 Look no further than Osaka Sushi in Annandale (6669 Little River Turnpike). Osaka is hidden out of the way on Little River Turnpike (Rt 236). 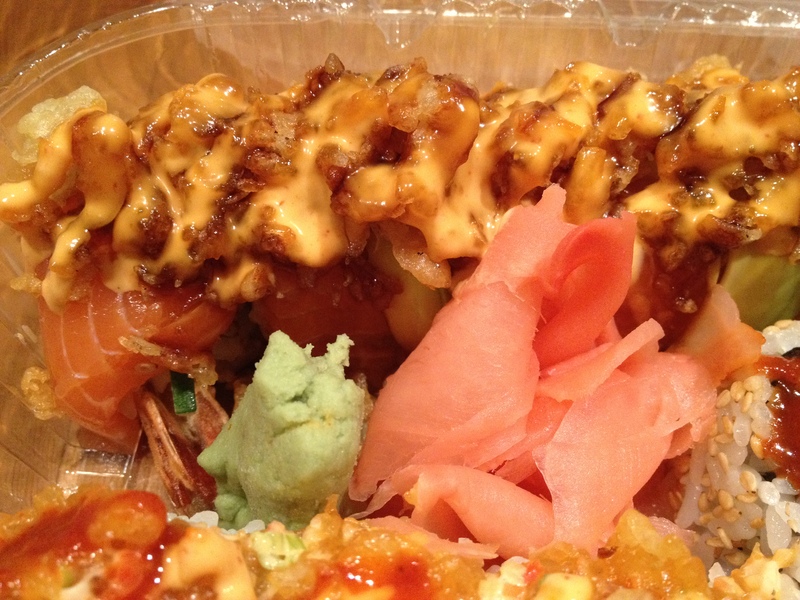 The sushi is top notch though, so it’s worth a little drive to get there. A selection of nigri, along with an order of spicy tuna roll. 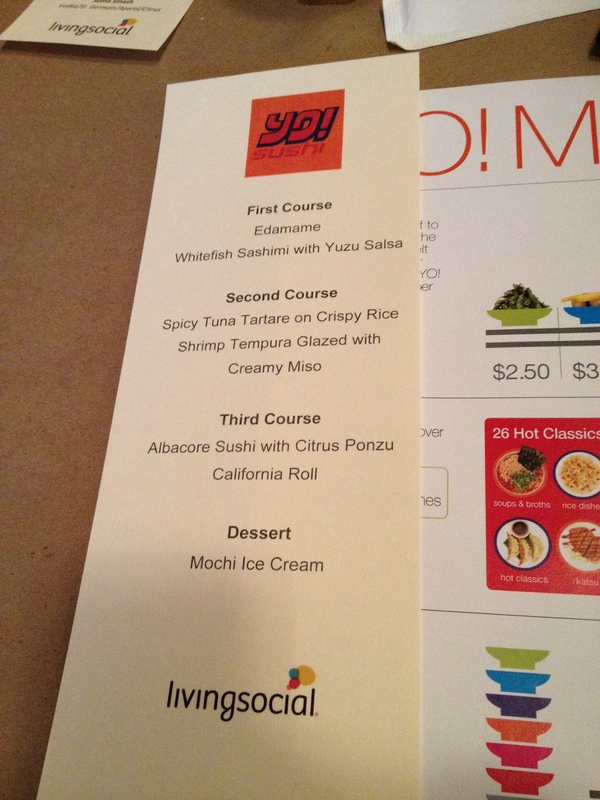 …and some of the special rolls. 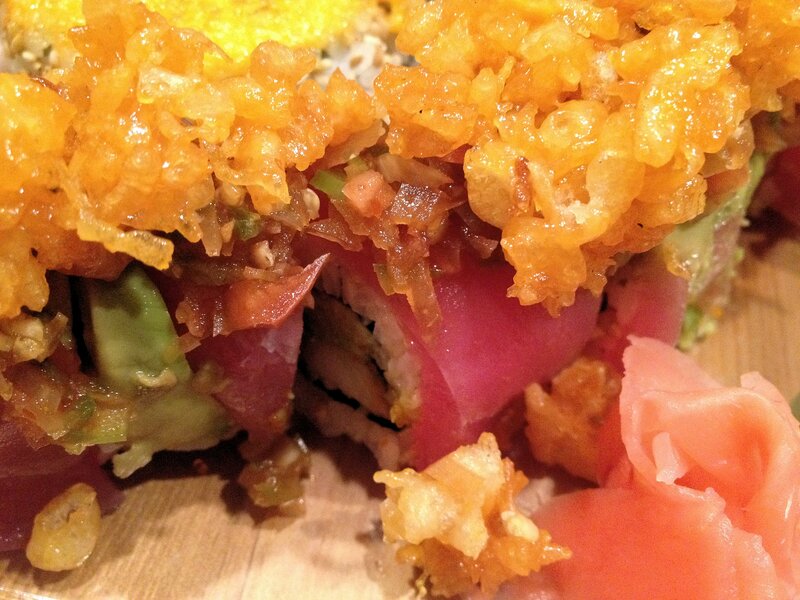 Foby’s Roll – A variation on its lighter cousin, the Salsa Roll (California Roll topped with tuna, avocado, and pico de gallo), this one adds a spicy tempura crunch to the toppings. This one is probably my favorite of the bunch. 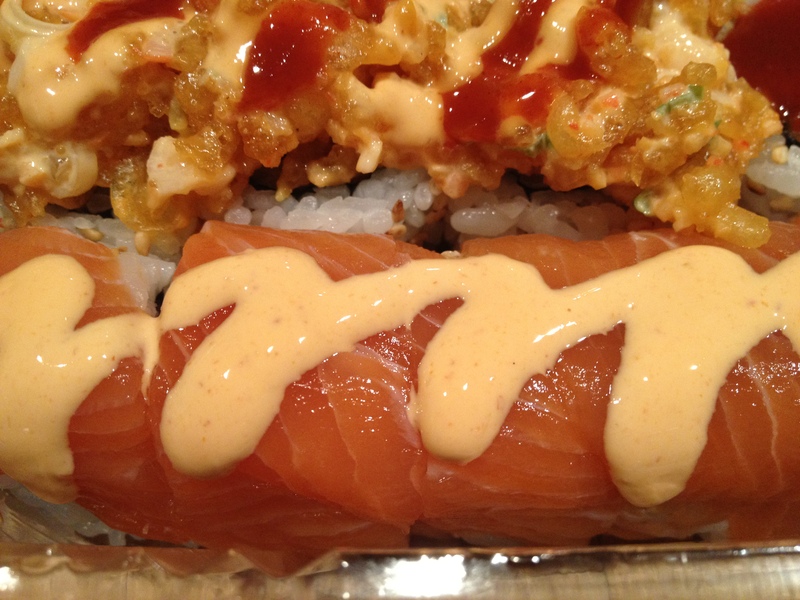 Jerry’s Roll – Tuna, ginger, jalapeno, and cilantro roll, with salmon and spicy mayo on top. This one is a little lighter due to the lack of tempura crunch. Reggie’s Roll – I’ve been told this is the most popular roll in the house. It’s a shrimp tempura, avocado, and cucumber roll topped with salmon, avocado, tempura crunch, spicy mayo, and sweet eel sauce. 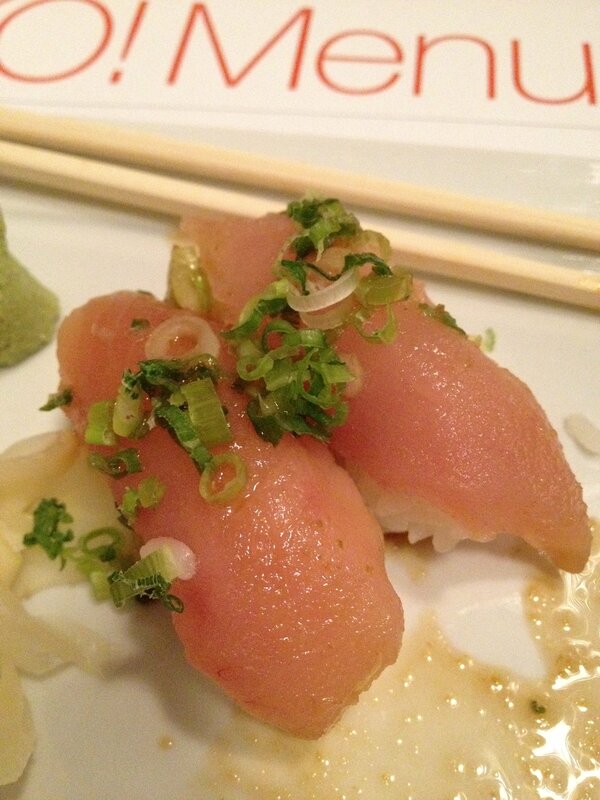 Very tasty, but it’s also a heavy roll…probably the equivalent of getting two rolls elsewhere. I’d recommend going with two of their special rolls to complement some lighter nigiri or sashimi (the super white tuna, seared tuna, or salmon are all good picks). 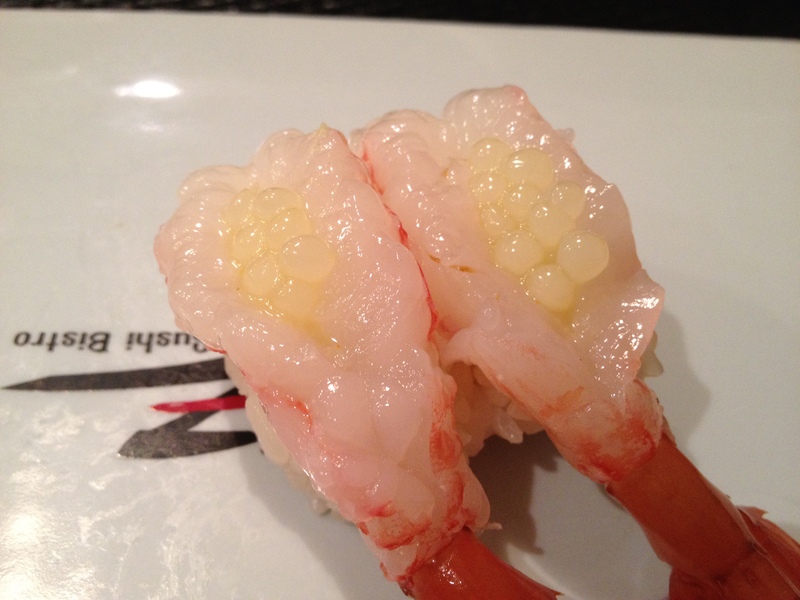 Going for more than two of the special rolls will quickly fill you up. 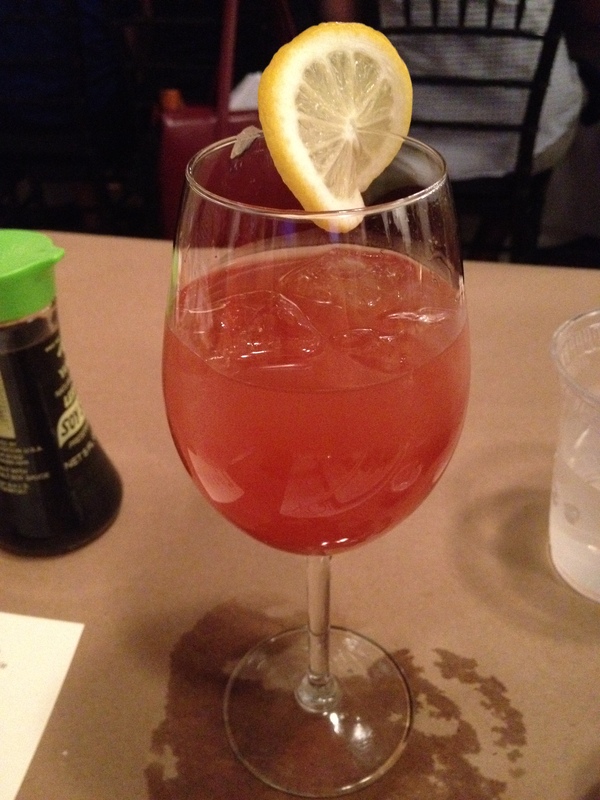 Add a glass of plum wine…I’ve always found the refreshing sweetness complements sushi very well.